Great car. Would buy again. 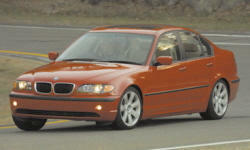 Why the 2003 BMW 3-Series? Car has had outstanding realiability considering its use daily in a four season climate. Parts are easly to get and inexpensive if you shop wisely. Many DYI resources on the net for regular service needs, and thus far most projects have been straightforward and easy. Car is well built and still has solid integrity at 113k. Interior has worn well, cleans up near to new. All controls work as new, seats still firm, doors shut vault tight. Car is by far our safest car due to the handling,DSC,and overall performance. Excellent in inclement weather including snow and ice. DSC is seamless and provides uncanny stability in slippery conditions, almost defies physics. My love affair with BMW six's continues. The powerband is matched perfectly to the car (5spd). Pulls much harder than the HP figures would indicate. Sounds flawless at high RPM. still runs as new at 113k. Excellent ergonomics. Very comfortable on long drives. Why Not the 2003 BMW 3-Series? Small boot. We have the 325iT. I seriously think there is more room in the sedan trunk. Sunroof is noisy at highway speed. Have had other (older) BMW's that this was not the case.